Personalised cotton gym towel in crisp white. 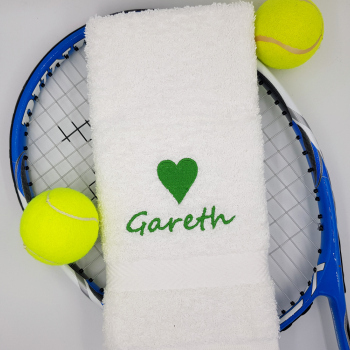 Personalised cotton gym towel in crisp white. Wipe your brow in style with a custom embroidered name, initials or team name and the optional addition of a little motif or logo. This gym towel is made smaller than a normal bathroom hand towel in a handy 60x40cm size, ideal for taking to the gym and not taking up too much space in a gym bag. Personalised cotton gym towel in crisp white. Wipe your brow in style with a custom embroidered name, initials or team name and the optional addition of a little motif or logo. This gym towel is made smaller than a normal bathroom hand towel in a handy 60x40cm size, ideal for taking to the gym and not taking up too much space in a gym bag. Made from 550gsm ringspun terry cotton for durability and performance, this lightweight gym towel is an essential piece to any work out. Please enter in the option box the exact name or wording you would like embroidered and choose the thread colour and font style you want. For a small additional charge we can also add a embroidery motif, Tick the Yes option and then click the green link to view and select a motif. If yo have a special logo you would like sewn, please contact us for a quote. Personalised gifts are made to order and dispatched in approximately 2-3 working days.